There are many ways to share quality time and adventures with kids. This guide is about creating childhood memories. Remember when you learned to ride your first bike? Childhood memories are usually the simplest of things. Jumping in a pile of leaves in the fall, making mudpies, snowball fights, playing in the rain, chasing butterflies, gathering eggs in the hen house, playing "dress up" like mom, hunting with dad, turning the crank on the ice cream. We all have memories of our childhood that are cherished in our hearts forever. It's not the things that cost the most money, it's the time spent with the ones we love the most that we'll always remember. Young parents of today should always try to spend quality time with their children. It's not what you buy them, but the memories you make together, that they'll look back on when they're grown. 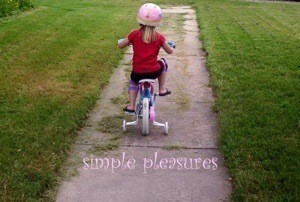 The simple pleasures that cost nothing, yet are priceless. Whenever our family takes a trip, I make it a point to make a scent theme. For example when we traveled to Las Vegas, I had a coconut theme going with coconut shampoo, lotions, soaps, etc. I knew we would be wearing sunscreen and tanning oils which already have a coconut smell to them, so I just embellished that. Now whenever we smell coconut scents, we are immediately taken back to poolside at the Monte Carlo. Past scents have included pine, cedar, and other essential oils for trips to the forest and earthy scents for our desert trips. You can also use a scent theme for the holidays. During Christmas time there is an essential oil available called "Scent of Christmas" I find it at Bristol Farms every year. I can't imagine a Christmas without it. Just one whiff from the bottle and voila, it's Christmas. You can use a few drops around the house, no burner needed. Isn't it amazing that God gives us a second chance to make up for the little things we missed out on, or took for granted when we were raising our children? And He does it through this wonderful miracle of life we call Grandchildren! My daughter will be starting kindergarten this year, and my due date is around the same time. It has occurred to me that in the next few months nothing will be the same for the two of us. I stay at home and we do everything together, but I'm afraid with a new baby and new friends at school things will change. I'm sure that our relationship will adapt, but I want to use the next couple of months to really create some special memories. Does anyone have any ideas? Maybe the two of you could take a little trip, just a girl thing and take lots of pictures. Maybe you could have a beauty shop day where you both get haircuts and maybe manicures. You could make a book together of your summer. Let Dad have a part and put your pictures and her drawings and words in your book. My son was 6 when my daughter was born. When I was pregnant, I would take him out to Burger King for breakfast and bring the game UNO. We always did a lot together like Chuck E.
Cheese and movies but who plays Uno at Burger King? It was our thing. We would also have movie night for the whole month. 4 nights a week. We'd rent movies or see what is playing on TV, get in my bed with a great treat and do our thing. One thing I did when my 2nd child was born. Everyday, when the baby slept, I set a timer for 30 minutes and gave my older son my undivided attention. He got to choose what we did and we called it "Mommy/Danny time." Danny is now 15, my middle son is 12 and my little guy is 4. They ALL still get their special "mommy/child time" (not as regularly, of course). It was the start of a great tradition that still goes on. Buy her a new stuffed animal of the same species each year, have a table cloth she uses each year and have her current invited friends sign it and leave a quick, cute message :) Save her every last drawing, frame pictures of her and her current room, blab blab blab, considering she wont remember it years later and neither will you without being reminded :P Write a little book about the cute things she does, and the not so cute. Her next haircut, keep a large snip of the hair, put the hair in little baggies with the date labeled, do this yearly, as well :D Keep a sample of the family pets, an d yours, too. Hope this helps! God bless, and don't take her for granted! she will only be a kindergartner for one single quick year!